Each title in the Geneva Reports on the World Economy series focuses on an aspect of the reform of international financial and economic systems and each is written by a team of internationally known macroeconomists. 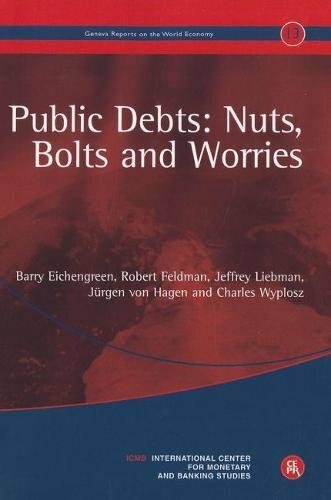 Public Debts looks at developed countries' public debts with an interest in the longer term: debt evolution and policies to deal with potential instability. Barry Eichengreen is the George C. Pardee and Helen N. Pardee Professor of Economics and Political Science at the University of California–Berkeley. Robert Feldman is a anaging director at Morgan Stanley. Jeffrey Liebman is the Malcolm Wiener Professor of Public Policy at the Harvard Kennedy School. Jürgen von Hagen is vice rector of Bonn University, where he is director of the Institute for International Economics. Charles Wyplosz is professor of international economics and director of the International Center for Monetary and Banking Studies at the Graduate Institute of International Studies in Geneva.